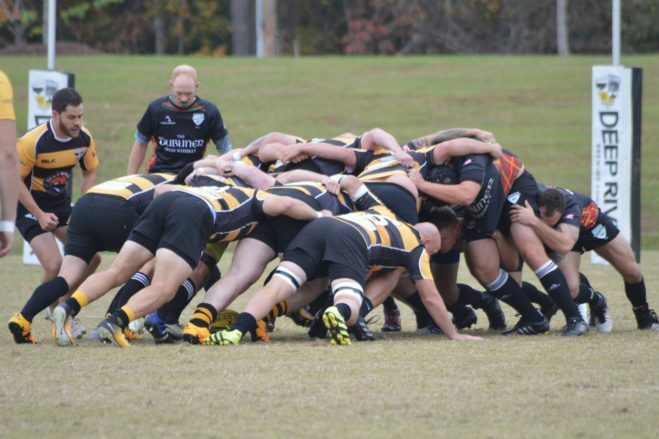 CLAYTON, NC – It was a busy day of rugby action in Clayton this past Saturday as the Clayton Rugby Football Club hosted a triple-header of rugby games at East Clayton Community Park. For the Bootleggers, it was their final home match of 2017, so the squads aimed to finish off on a high note for fans. For a curtain raiser, the club hosted East Carolina University against Coastal Carolina in a pivotal Southern Rugby Conference match up with National Playoff implications. Fans were treated to a battle as the two sides played a close and intense match. ECU took a narrow 10-7 lead into halftime, but two yellow cards in the second half gave Coastal the advantage needed to surge out to a 21-10 lead with less than 20 minutes to play in the match. ECU clawed their way back into the game with a forward oriented attack and closed the gap to 21-20 with less than five minutes to play. A try in the final few minutes gave ECU the victory. They now move on to play the winner of the Cardinal Conference with a trip to the USA Rugby D2 Nationals on the line. Trying hard to top the opener, the Bootleggers 1st XV took the pitch against Hilton Head in a Carolinas Division III Conference match. The squad came into the match expecting a close battle and got exactly that as Hilton Head did their best to spoil the club’s final home match of the Fall. Hilton Head got off to a great start as they were on the board first with a converted try in the 5th minute. The Bootleggers bounced back with a try from lock Jeff Cosgrove in the 13th minute. The conversion from Ed Dixon knotted the score at 7-7. From there, the Bootleggers started to take control of the first half with strong set piece work and ball retention. They were rewarded for their work with an 18th minute try from center Connell Smallwood who found a seam to score from short range. The conversion gave Clayton a 14-7 lead. Minutes later, No. 8 Gareth Davies was on the receiving end of a nicely worked try after some nifty support work and offloads opened up space to run through the visiting defense. With the score at 19-7, the Bootleggers were once again on the front foot and threatening to score deep in the Hilton Head half. Just five meters out from the end zone, a Hilton Head player intercepted a pass and went the distance to turn the tide and cut the Bootlegger lead to 19-14 with 15 minutes to play in the first half. The Bootlegger’s set piece answered back. After a penalty put Hilton Head deep in their half again, Clayton scored off of a nice line out play from five meters out. Flanker Ted Hardy was the recipient of the try as the Bootleggers pushed their lead out to 24-14 with less than ten minutes to play in the half. As was the theme for the match, Hilton Head answered back as they capitalized on another turnover to put points on the board just before halftime. The try cut the Bootlegger’s lead to 24-19 at the half. The second half started off with a frantic pace as both squads set out to get on the board first. It was the Bootleggers that struck first in the second half with a penalty goal from Ed Dixon to extend their lead to 27-19. Hilton Head fired right back with a 46th minute try to cut the lead to 27-24. After kicking all of the Clayton points, Dixon added a try after Nick Taylor stole a line out ball from Hilton Head deep in the opponent’s half. The try from Dixon pushed the Bootlegger’s lead out to 32-24 with 15 minutes left to play in the match. The final 15 minutes were a battle as Hilton Head swung the momentum in their favor with a pair of tries to take a 34-32 lead with ten minutes to play. Clayton regathered and went back to work pushing the ball into Hilton Head’s territory. The home side retook the lead with a penalty in front of the posts. Dixon knocked down the penalty goal in the 71st minute to give the Bootleggers a 35-34 edge. Another penalty goal from Dixon just two minutes later extended the lead to 38-34. With the match still hanging in the balance, the Bootleggers thwarted one more Hilton Head attack and worked the ball deep into their opponent’s half. With time expiring, Dixon fed a crashing Ted Hardy for his second of the day as he crashed over from five meters out. The conversion gave the Bootleggers an important 45-34 victory. Dixon finished with Man of the Match honors after scoring 20 points on a try, three conversions, and three penalties. 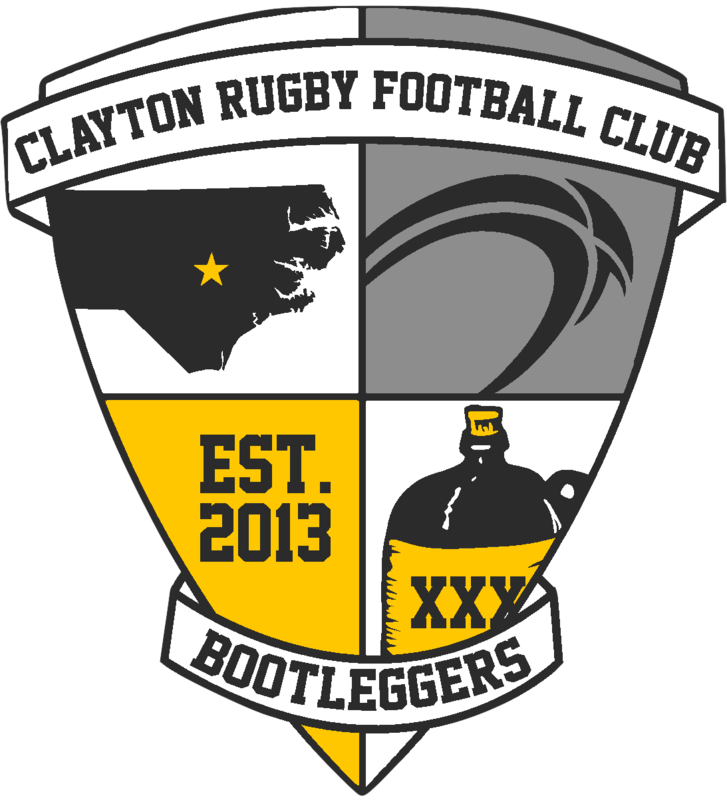 With two matches down, the Bootleggers 2nd XV took the pitch against the new South Wake club that is forming with students from Wake Tech. The 2nds produced a strong effort against the new side and opened things up in the second half to run away with a big win. The two sides locked into a tight battle for most of the first half as they traded possession. The Bootleggers were the first to strike when wing William Ashley scored the first of his three tries in the 10th minute. The lead didn’t grow until the 25th minute when Wesley Smith crossed over. The conversion from flyhalf Jesse Rinehart gave the 2nds a 12-0 lead. South Wake scored their first and only try of the match a few minutes later to cut the lead to 12-7. A try from Deven Howard, his first of four on the day, gave the Bootleggers a 17-7 lead. The score began to open the match up as the 2nds finished the 1st half on a high note with tries from Ashley and Jared Thomas to extend the lead to 29-7 going into the break. The 2nds picked up where they left off in the second half as the side played solid, structured rugby that gave the back line plenty of good ball to work with. The backs used the platform to open with the scoreline. The Bootleggers got three more tries from Howard, three from Eric Hile, another from Ashley, one from Derek Braun, and Dylan Johnson scored his first career try in his first ever match. The resounding victory finished off a clean sweep for the home sides and served as a great final home stand. The Bootleggers have one final match this Fall against Camp Lejeune on November 18th before taking a break for the holidays.